Three Men in a Boat by Jerome K. Jerome is one of my favourite books of all time and even recalling it now makes me chuckle. 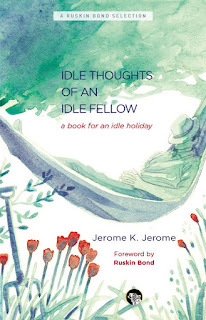 Having read it back in 2011, I thought it was high time to explore more from this eccentric and witty author, so I picked up Idle Thoughts of an Idle Fellow. Big mistake. Huge. Unfortunately, this was one of those times and I just didn't enjoy Idle Thoughts of an Idle Fellow. There were moments of humour and cleverness, but by the end I was left wishing I'd never picked it up. As a reader, I was greedy to recreate the magic of Three Men in a Boat where I should have been content to leave it as a standalone reading experience beyond compare. Have I learned my lesson though? Probably not. * Which is why I'm reluctant to read anything else by John Williams, author of Stoner.